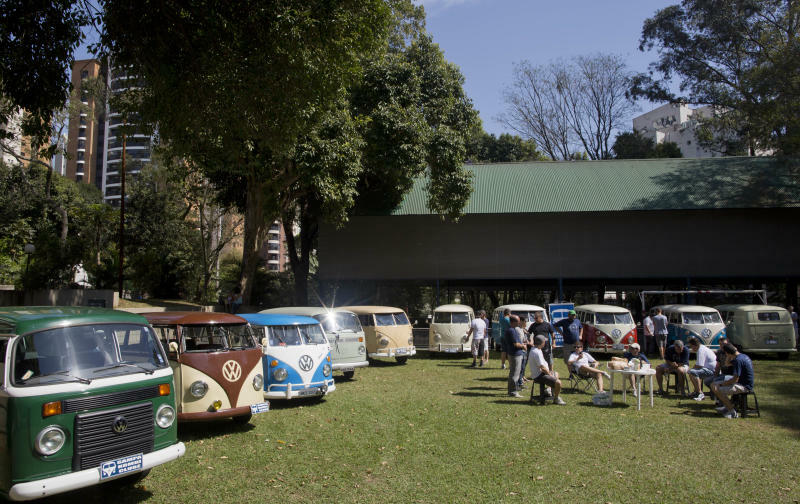 SAO PAULO (AP) — It carried hippies through the 1960s, hauled surfers in search of killer waves during endless summers and serves as a workhorse across the developing world, but the long, strange trip of the Volkswagen van is ending. Brazil is the last place in the world still producing the iconic vehicle, or "bus" as it's known by aficionados, but VW says production will end Dec. 31. Safety regulations mandate that every vehicle in Brazil must have air bags and anti-lock braking systems starting in 2014, and the company says it cannot change production to meet the law. "The van represents freedom," said Damon Ristau, the Missoula, Montana, director of the documentary "The Bus," which follows van fanatics and their affection for the machine. "It has a magic and charm lacking in other vehicles. It's about the open road, about bringing smiles to peoples' faces when they see an old VW van rolling along." Perhaps nothing with a motor has driven itself deeper into American and European pop culture than the VW, known for its durability but also its tendency to break down. Van lovers say its failures only reinforce its charm: Because its engine is so simple, it's easy to fix, imparting a deeper sense of ownership. The van made an appearance on Bob Dylan and Beach Boys record album covers, among many, though in music circles its most closely linked to the Grateful Dead and the legion of touring fans that followed the rock group across the U.S., the machines serving as rolling homes. Steve Jobs is said to have sold his van in the 1970s to buy a circuit board as he built a computer that helped launch Apple. The vehicle is linked to the California surf scene, its cavernous interior perfect for hauling boards. But in poorer regions like Latin American and Africa, the vehicle doesn't carry the same romantic appeal. It definitely doesn't hold the cool mystique in Sao Paulo that it does in San Francisco. It's used in Brazil by the postal service to haul mail, by the army to transport soldiers, and by morticians to carry corpses. It serves as a school bus for kids, operates as a group taxi, and delivers construction materials to work sites. 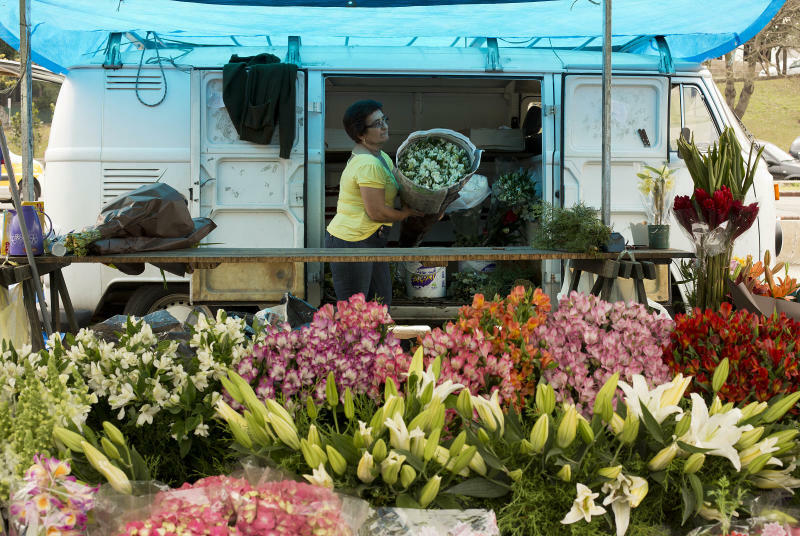 Brazilians convert their vans into rolling food carts, setting up on street corners for working-class lunchtime crowds. In Brazil it's known as the "Kombi," an abbreviation for the German "Kombinationsfahrzeug" that loosely translates as "cargo-passenger van." 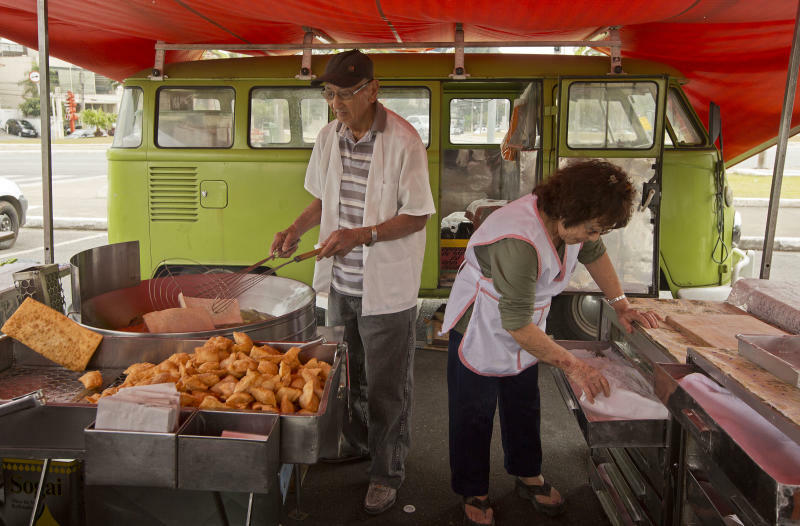 One recent drizzly morning in Sao Paulo, Jorge Hanashiro took a break inside his light green 1974 Kombi while his wife, Anna, served deep fried meat and vegetable pastry pies to customers at an open-air market. "There may be safer and more modern cars around, but for me the Kombi is the best vehicle to transport my stall and products to the six open air markets I visit each week," the 77-year-old Hanashiro said. "It is economical, rugged and easy to repair." The vehicle has found its way into the hearts of Brazilians like Enio Guarnieri, 54, who stood grinning next to the blue-and-white 1972 van he keeps in his cluttered garage in a working-class Sao Paulo neighborhood. Guarnieri bought the vehicle a year ago to stoke childhood memories. When he was 10, his father taught him to drive a van. "Driving a Kombi with your face up against the windshield is a thrilling adventure," he said. "There is no other van like it. There is no other van that is so easy and inexpensive to maintain. Anyone with a minimum amount of knowledge about engines and a few tools can fix a Kombi." A VW plant in Mexico stopped producing the classic version of the van in 1995, though it continued to make its engines for another six years. That left a factory on Sao Paulo's outskirts as its last lifeline. Production in Germany was halted in 1979 because the van no longer met European safety requirements. Sao Paulo advertising executive Marcello Serpa says the van's spirit will live on after its demise. He has a 2007 version meant to have a 1960s American hippie feel. He painted it in bright green, yellow, blue and red colors with cartoon-like drawings of his wife, daughters and himself, surfboard in hand. Serpa said the bus evokes "a spirit of playfulness and happiness," causing people to pause and smile when he drives it down Sao Paulo's chaotic streets. "The Kombi is part of Brazil's cultural and emotional landscape," he said, "and that explains the strong feelings of affection most people have for it."